TEMPLE, Pa. – Temple residents will get their first look at the newly remodeled Walmart Supercenter at 5370 Allentown Pike on Wednesday, Aug. 30, when the much-anticipated project is completed. 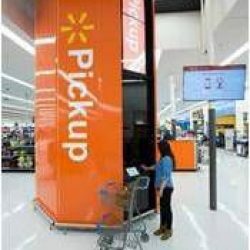 As part of the remodel, the store will be the first in Pennsylvania to debut Walmart’s new Pickup Tower technology. These 16-foot tall structures function like high-tech vending machines and can fulfill a customer’s online order in less than a minute. To use the Pickup Tower, customers simply choose from millions of items available on Walmart.com and select the Pickup option at checkout. When the item arrives at the local store, an associate loads it into the Pickup Tower and the customer retrieves by scanning a bar code sent to their smartphone. The Pickup Towers are the latest example of how Walmart is using new technology to save its customers time and money, and allowing them to shop however, whenever, wherever they want. Last October Walmart shared that it is investing around $6 billion this fiscal year in the US in store growth, store remodels and innovations like Pickup Towers and Online Grocery Pickup. “The Pickup Tower pilot phase has been so successful Walmart is expanding it to additional locations across the country – and we’re proud to be the first in Pennsylvania,” said Store Manager Cesar Sabio. “That’s just one of the highlights of our recent remodel. During the day, customers are invited to the grand reopening celebration. There will be customer giveaways, hot dogs, pizza, free samples and activities for kids. Visit https://www.facebook.com/Walmart2614/ for more news about your Temple Walmart.